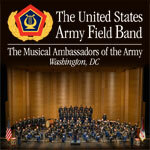 The internationally acclaimed United States Army Field Band of Washington, DC will continue its long tradition of presenting free public performances when it appears at The Pullo Center on June 12 at 7:00 p.m. The Army Field Band’s concert in York, PA and is sponsored by The Pullo Center. Free tickets for this event can be picked up at The Pullo Center Box Office. The Concert Band is the oldest and largest of The U.S. Army Field Band's four performing components. Founded in 1946, this elite 65-member instrumental ensemble has performed in all 50 states and 30 foreign countries for audiences totaling in the hundreds of millions. Tours have taken the band throughout the United States, North and South America, Europe, and Asia. The Concert Band appears in a wide variety of settings, from such famous concert halls as the Berlin Philharmonic and Carnegie Hall to state fairgrounds and high school gymnasiums. The Concert Band regularly travels and performs with the Soldiers’ Chorus, together presenting a powerful and diverse program of marches, overtures, popular music, patriotic selections, and instrumental and vocal solos. The organization has also performed joint concerts with many of the nation's leading orchestras, including the Boston Pops, Cincinnati Pops, Detroit Symphony Orchestra, and more. In addition to formal programs, the Concert Band has participated in numerous presidential inaugural parades and supported many diplomatic missions overseas. The dedication and musicianship of the members of The United States Army Field Band represent the professionalism that American Soldiers have embodied during nearly three centuries of proud service.